When humanity was threatened 5 years ago, the boy who saved the world was driven to despair and became regarded as the enemy of all of mankind. And now a new crisis approaches humanity. The curtain rises on a gallant drama about a hero falsely charged. Short Version: It's truly an average LN for one in this genre. There's nothing really that stands out and deserves merit, but it is certainly not as bad as it could be. I've read worse. If you are considering whether to read this, ask yourself if you have read any LN similar to the synopsis. If so, this is really not worth reading. If not, use it as an introduction to the genre, then go watch some other anime like this. 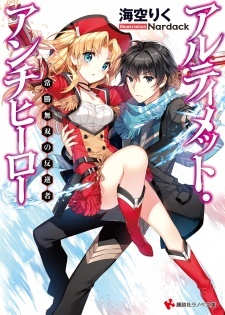 Note: I have a feeling this was cut short early by the publishers, because halfway through the 4 volumes, I had a feeling the world and plot was a lot bigger than what was delivered in the last two volumes of the LN. Keep this in mind. It could have been better. And now for the review. I'll start with the art, since this is the least important part of a LN. I thought it was decent, with some good character designs and some nice costumes. Like most LN art, the characters seem to have a very rounded design, which I am not too fond of. Nothing that will turn you away though. It doesn't take getting used to like the designs in One Piece. I gave it a 7. Now, we move on to the plot. Honestly, I found it terribly weak. It might be because I have read a lot of LNs like this though, since I did enjoy it and finished it in one sitting. It's short, with just 4 volumes. I disliked the immense number of deus ex machinae in every volume. This is to be expected with a character who is introduced as being more or less invincible. All of the motivations of the characters seem forced, like it is included in the plot only because it is the standard in such LNs. Characters fall in love and have crushes or get angry very predictably. It is easy to guess where the plot will go. Thus, at many points, you see major plot components go unexplained by the author, with the reader still understanding why the event has occurred, although by drawing their knowledge of other, better LNs. Also, as I have mentioned, it had a rushed ending. I gave it a 3. Characters are also poorly created in this LN. The MC is not a very interesting character. His personality is quite like a Gary Stu in that he is immensely powerful and et acts very humble and kind, supposedly inducing the kind of heartthrobs among adolescent girls that make them go weak in the knees. He barely faces any reason to mature as a character. The great tragedy of his past did not seem as traumatic to me as the author evidently thought it ought to be. The female characters are also quite the same, showing growth spurts in power that can only be described as deus ex machinae and showing no development as a character at all. The only character I liked was the fairy queen Elfiena. The members of the World Government were abhorrent and made me wonder why exactly they were even made the leaders of their countries. I also quite liked Michael, the effect he has on other people being interesting to read. Overall, I gave it another 3. On the whole, I did enjoy the LN. I did read it in one go. However, it is not very memorable and I probably will never bother reading it again. Skipping this one would not be a tragedy. So try it if you have the time. It's certainly not a nauseating experience, but if you are looking for a quality read, or a gem among the coal or something that makes you change your perspective n the world, or something entirely immersive and cathartic, this is not the option for you. I would agree with others this is just average, to a bit above average. I cannot go into much detail as to not spoil anything and some may consider this so just note I would give it a 6. If you read the maybe spoiler and are okay with it then I would give it at least a 7, as it did mix things up and I did not see certain things coming. I read a lot so most things I see coming as they were already done by someone else. *Maybe considered spoiler* The ending is not closed right. In fact it is left open ended. This ruined it for me to end with the same problems the world started with. If there was nothing that could be done then it is fine but that is not true. At the end of the book series all the knowledge on how to stop their issues is acquired by our main hero, and within there abilities even if it was over time. Even though there will not be another book written this one was not closed out even with such a good available. I problem solve for a living so I ruin books like this for myself a lot but this one was super easy to see the solution to.